“You never get a second chance to make a great first impression.” We have heard this time and again but sometimes we forget just how much that first impression matters in our businesses. While you may be the best around, if you are not organized, using up to date technology and professional, it will show through your bid, and you will surely lose some potential clients. Your bid is your true first impression to your clients and how you present yourself matters. Appearing professional will help your customers trust you and show them that you take your work seriously. At Knowify, we offer a custom templating service complimentary with your subscription. The templates that we create are organized and easy to read, use the latest technology and will make you appear professional to your clients. The office side of the business is frequently unloved in construction. We like to joke that nobody ever got into construction so they could sit at a desk working on spreadsheets all day. Because construction guys would much rather be in the field, they often develop little workarounds to make the office side of things faster – but as with any workaround, they give up something in the process. You’re busy – really busy. Running your business, working on many jobs at once, and expected to remember every detail of every job. How do you manage to remember these details? With Knowify of course! We have a handy Job Log that will track every step of the way: what has happened with a job, when it happened and who made it happen. Incase this is a new feature to you, let me introduce you: meet your Job Log. Your job log displays a chronological timeline of your job and merges user actions, comments, documents and emails to capture the whole job history, giving you the ability to see and analyze how the job has evolved. Should I Include Overhead in My Job Cost? Including overhead in job costs only tells you about the past. Focusing on project-based profitability helps you plan for your future. Feature of the Week: Mobile Onboarding! You may have already heard by now that our mobile app is really awesome! It has the ability to track employee time with GPS functionality and can capture photos of receipts. But what good is an incredible app if not everyone on your team is using it? We have noticed a disconnect between the office and workers on the field in understanding where your employees stand on their mobile onboarding. We are ready and eager to bridge this gap and create easy communication – we even went as far as adding a Spanish option- ¡de nada! 1. Enhanced experience to select subs for your phases: Over the next few months the process to select a sub for a job phase will be simplified. For starters, now you can select an existing job or create a new one right from the project plan. No need to go back to the vendors section any longer. 2. Job column in Manage Bills: Even if you have allocated bills against multiple phases, we’ve developed a new feature that will let us display the main job involved in the bill. 3. Improved experience with purchases against multiple jobs/phases: Similar to the previous feature, now we can display the main job involved in a purchases even if the purchase is made against different phases of the job. 4. New sync of payments with QuickBooks: We’ve strengthened our ability to pull bill payments from QuickBooks Online, even if the payment is against multiple bills and you don’t have all these bills in Knowify. We’ve also improved the management of voided/deleted payments. 5. [BONUS] Service templates in Contracts: This is like a hidden gem. Now you can drop service templates in a draft contract, enter the number of units and Knowify will automatically come up with the price and breakdown. Preparing an estimate has never been quicker! Overwhelmed with overdue client invoices? CollBox is your solution! Do not let your company down by falling into the struggle so many contractors in America are facing: failing to collect payments from their clients. CollBox is an application that makes it faster and easier for companies to collect payments on their past-due invoices. In just three clicks, their QuickBooks integration allows customers to automatically send outstanding invoice data to a collection agency. CollBox’s network of professional, effective collection agencies will quickly work to recover the money owed to contractors by utilizing data from the company’s QuickBooks account. The CollBox app will show what is collectible, and connect users with the right company to get the best rate on collections. CollBox is an incredible tool that allows contractors to stop worrying about collecting money, and spend more time and focus on efficiently managing their jobs. And for more information on Knowify shoot us an email at support@knowify.com ! We just released a new version of Knowify with a large number of new features and improvements. All these changes are based on your feedback so we hope you are as excited as we are! 1. 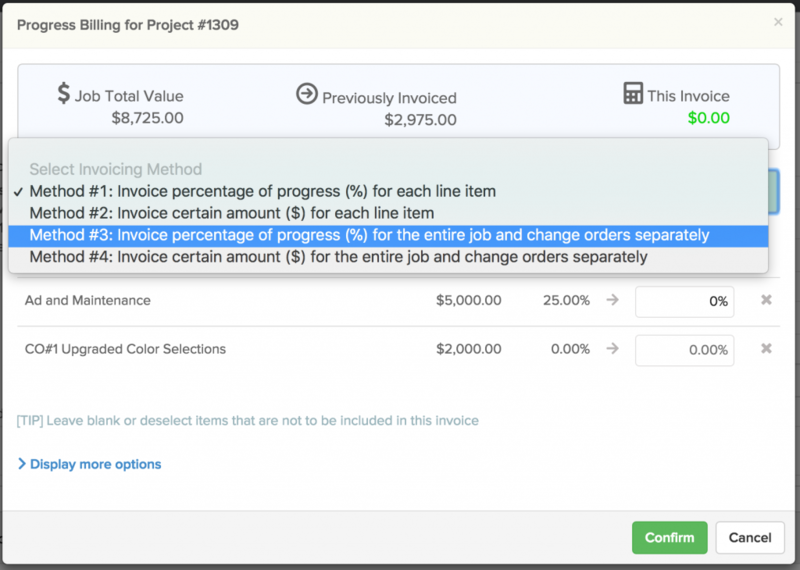 Ability to invoice fixed priced jobs at the line item or job level: Now, when you have a fixed price job that requires regular invoicing, you can invoice progress for each line item or just invoice a part of the entire job. For those of you that, for instance, invoice 10% upon signature, 40% when the job starts, and the rest when the job is complete, you can now easily do that and you don’t have to deal with each line item included in the proposal. Additionally, we’ve improved the user interface in the progress invoice popup, which will give you information about the total value of the job, previously invoiced value and current invoice. 2. Unsaved changes warnings: Losing changes because you didn’t save them is a bummer and now we’ll help you avoid this issue in the Plan&Track and Contract sections. If you navigate away without saving the changes, Knowify will give you the option to go back and save your changes. 3. Enhanced mobile onboarding: We always wanted to make the onboarding of mobile users as seamless as possible and now we are one step closer with our new Mobile Onboarding wizard. 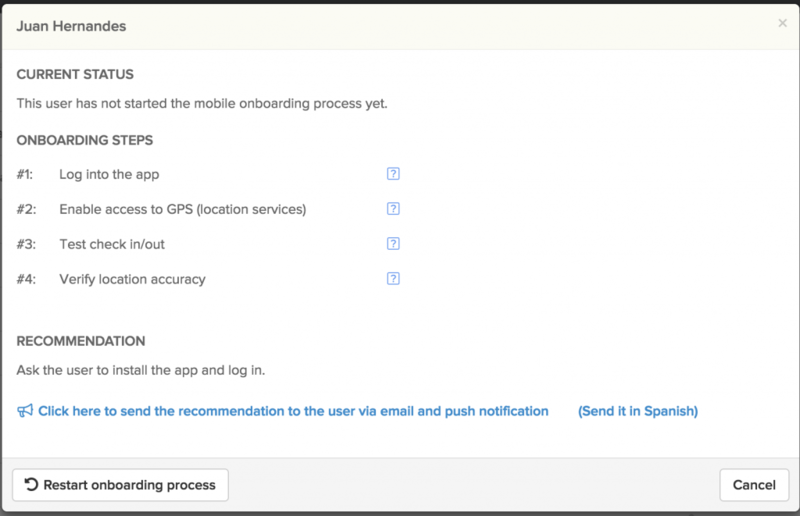 With this wizard, you’ll be able to track the onboarding process of your mobile users and help them if they get stuck. Knowify will help you communicate with them in both Spanish and English with predefined help messages. Meanwhile, in the smartphone app, the mobile users will go through a simple onboarding wizard that will guarantee that they can check in, check out and provide location information. 4. Quickly build an itemized budget from a accepted proposal: Many of you rely on our Simple and Advanced modes for your jobs because they allow you to create proposals and send them to your customers very fast. Now, if you use these modes, you can also create a complete and itemized internal budget in Plan&Track once the proposal has been approved. 5. Enhanced RFI management: We have made RFIs even more powerful and with these changes you can now set the RFI number or the expiration date. We’ve also improved the user interface so that you can also easily determine the expiration date and extend it if necessary. 6. Easily include job comments in invoices: When creating a new invoice, you can view and add any comments connected to the job, either from the field or the office. This way you can collect the necessary pieces of information while completing the job and provide them to the client to craft a more complete and thorough invoice. – Products and services used in contract breakdowns will automatically calculate markups based on your catalog prices and costs. – Now you can easily access the client contact information from the job section. – Subcontractors can be created in the Users section without having to create them in the Vendors section first. – When creating a new invoice you’ll be warned if there is an existing draft invoice for the same job. – Invoices for service jobs will rely on the company default payment terms. – When creating a new invoice for a cost plus job you’ll be warned if there is unapproved time for the job. – You can undo the rounding in time entries in the Review Time section. – For non-US companies, jobs with holdback will not allow the users to modify the price or quantity in the invoice to preserve the progress calculations. – The Manage Contract Jobs section will now provide information about budgets when available. – Fixed issues about formatting manually typed dates in bills and purchases. – E-signature reminders can now be sent from the contract section. – Item description can be edited after the Subcontractor PO has been issued. – Fixed issues around invoicing change orders approved on the same day as the invoice. – Improved performance in the Purchases History section. – Fixed issues around calculating the opportunity value for copied jobs. – Improved user interface in Plan&Track where we’ve grouped some secondary actions (scroll top/bottom, collapse/expand). – The check in/out view will allow you to change the date of the check in/out. – New beta Subs Report with all the contact information for the subs involved in the job. – Improved users interface in the map section of Service Jobs. – (QuickBooks) When creating a subcustomer for a new job, the subcustomer will take the email of the client’s job. – (QuickBooks) When sending invoices to QuickBooks, the invoice will include the email of the client. – (QuickBooks) Improved widgets in the user interface to view the sync details. – (QuickBooks) Automatically trim long descriptions in invoices and bills to prevent QuickBooks errors. – (QuickBooks) Setting the default catalog income and expense account are now part of the mandatory QuickBooks setup. – Visual cue in the footer of Knowify to let you know if the real time connection has disconnected and allow you to reconnect it. Do not hesitate to reach out if you have any questions! Our new release is out! As usual, this release includes many improvements, most of them based on your feedback. Please pay attention to the first two items below, which will definitely change the way you use Knowify (for the better!). Also, stay tuned because we’ll be releasing additional new features before the end of the year. This is just a change in names; all these job types will behave as usual. You can find more information in this video. 2. We have also simplified the status of a job in Plan & Track. From now on, the Plan & Track section will be Active by default when the job is active, and will stay in Edit mode while you are budgeting or bidding a job. You don’t need to remember to switch the status any longer; Knowify will do it for you. 3. Job creation: We are moving the Job Name to the top of the page. This will create a more logical flow and will allow us further improvements in upcoming releases. 4. Anti-spam filter measures: We continue to optimize the emails coming out of Knowify to ensure that they are delivered. Even though our tested delivery rate was already very high, this new release goes one step further and adds extra measures to avoid spam filters when sending emails via Knowify. While there is no technical way to guarantee 100% email reception, in large part because it depends on how each email user sets up their spam folder, these changes will continue to push our delivery rates up toward the targeted 100%. 5. Taxes for non-US companies: We’ve strengthen the rounding system to make sure there are no discrepancies when adding taxes to your invoices or purchases. Also, for those syncing with Quickbooks, we’ve been able to circumvent a Quickbooks API bug to sync purchases and bills with taxes. 6. Improved bidding process: We will be gradually including improvements in the process to prepare proposals in Knowify. For starters, you’ll see that breakdowns include now a way to label each line as labor, materials or other. This is just in preparation for upcoming releases where we plan on radically simplifying the breakdown process and giving you more options to display them to your customers. These labels will also help Knowify automatically build budgets and list of materials when working in Simple or Advanced job costing modes. 7. Time & materials work: We have strengthened all workflows related to time & materials work. Now, before invoicing, the system will prompt you to enter the timeframe for the invoice, which will help identify the correct billable items. The invoice will also give you internal information about the value in materials, the value in labor and the total number of hours included in the invoice. – After creating a bill, invoice or any other QuickBooks-related transaction, you will not need to refresh the page to see if it synced properly. Knowify will automatically display the updated status as soon as the transaction syncs with QuickBooks. – Time entries will now take the Service used in Plan and Track (if any), which will take precedence over the general default service for time entries. 9. RFI link: In RFIs, we’ve seen recipients struggle at finding the attachments given that they didn’t think they had to click the link View RFI to get there. To make it clearer, if you use attachments in RFIs, the link in the email will read View RFI & Attachments from now on. 10. Improved display in contract jobs: We’ve restyled the display in the manage contract jobs page, to make it easier to read. Total values for jobs are now on the revenue side to give you a sense on how much you expect to generate for a given job. 11. Save reminders: While building your bids, Knowify will prompt you to save your work every 10 minutes. This is the first step towards making sure that you never lose any of your work. In upcoming release we’ll include additional enhancements. – Faster search in contract jobs, and fewer display issues in low internet speed networks. – PO numbers can be added or edited right in the invoice page. – Both phases in the project plan and line items in proposals have a new sorting feature. – Client and vendor exports include the full address. – Sorting line items in the schedules of values are being properly displayed in the final invoice. – RTF files are not accepted as attachments. 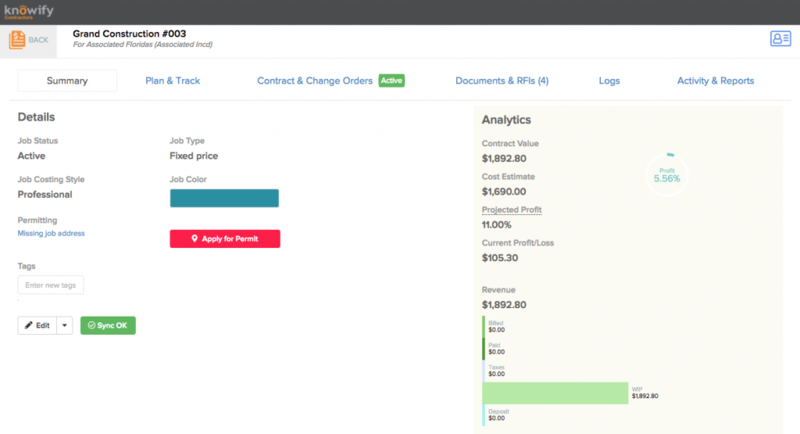 – Invoice items can be removed in bulk. – Time overview page offers new filters. – After deleting an invoice, you can return to the invoices section or to the job. – Service tickets include PO number field. – Job tags can be added when creating a new job. – For those using pay apps (in our Fixed Price with AIA billing jobs), now you can set a default for your preferred invoicing style. Wiping values in the invoices will also be easier. – In non-US companies, there is a new display of holdback amounts. – Fixed issue around marking phases with deleted resources as complete. – Fixed issue when updating Advisor users. All these improvements will help you work faster and spend less time in the office. Do not hesitate to reach out if you have any questions. We are thrilled to announce a new game-changing addition to Knowify’s lineup of tools designed to streamline the way you apply for, pay and receive construction, sign and solar related permits. Beginning 10/17, Knowify will offer a direct integration with PermitZone, the leading platform for sourcing construction permits across the United States! This integration will be fully available in Florida, California and Texas, and we’ll extend it to the rest of the US shortly thereafter.